Appears to be at least some potential for severe weather before the Gulf of Mexico gets shut down until the last week of March. Unidirectional winds but extremely strong speed shear just ahead of the front. Furthermore, looks like there'll be an inverted V profile with seasonably warm temps and seasonably modest dew points... this'll enhance downdrafts and therefore the damaging wind threat. Wednesday night into early Thursday morning. before winds subside somewhat as mixing becomes a bit more muted. IND discussion from this morning regarding the wind gusts. GFS maps posted below seem to agree with them from a high level. morning will lift northeast and open up through Thursday night. Thursday afternoon. Will highlight in the HWO at this time. I went ahead and created a thread for the wind event to keep this one on track for severe weather. 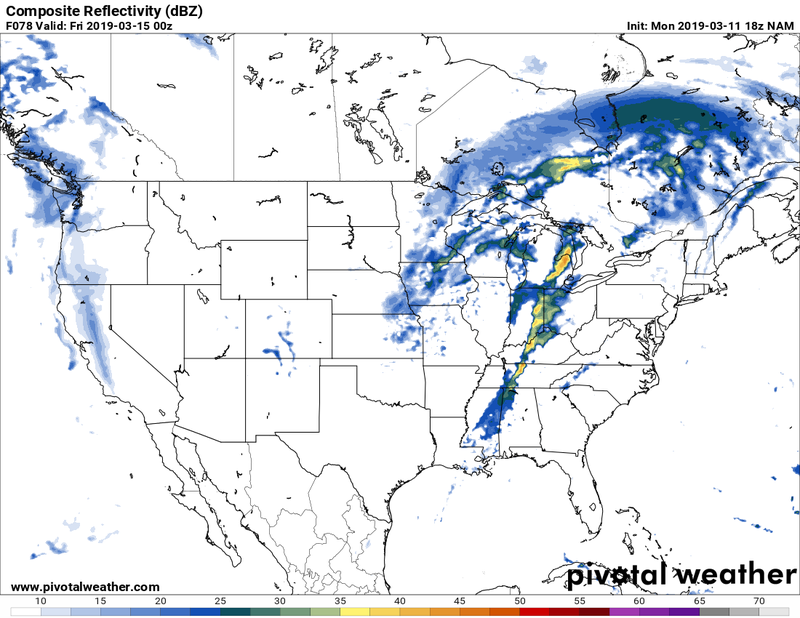 lull in precipitation late morning into early afternoon. 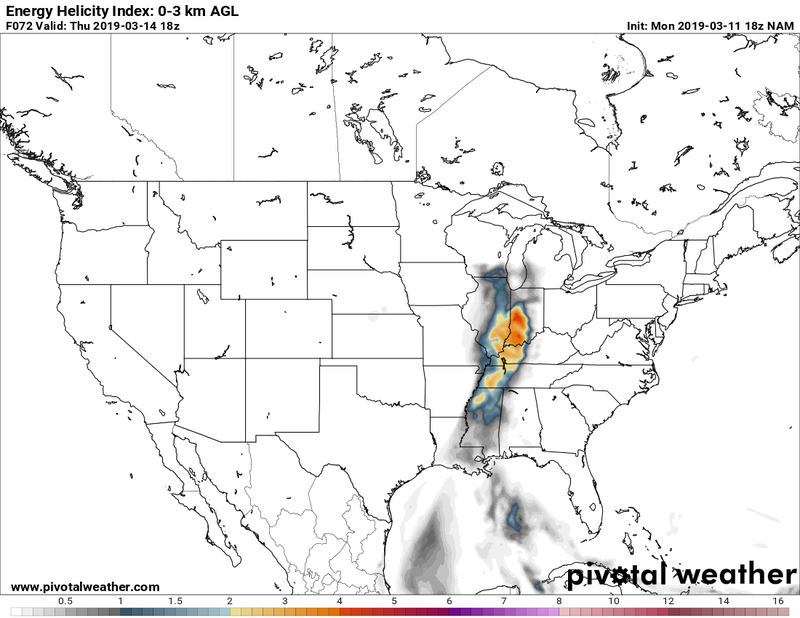 Latest GFS has a little more of a tornado threat in SW OH. Got rid of the dry low-levels and allows for a little more directional shear. NAM being the NAM. Interestingly has semi-discrete storm mode. Latest ILN AFD still liking at least some severe potential, with NAM being the higher severe threat. the northwest to the lower 50s in the southeast. I do wonder if the drier solutions show back up(though not going full on inverted V) if we could potentially see some LP Supercells with a bit more turning. Lol the 18z NAM could possibly support a LP supercell in southwest Ohio. SREF has a mean MUCAPE of 500-600 j/kg for central Indiana and SW OH. For SW OH, a few members have 800+ j/kg... and about 5 members in central IN, 3 of which are >1000. 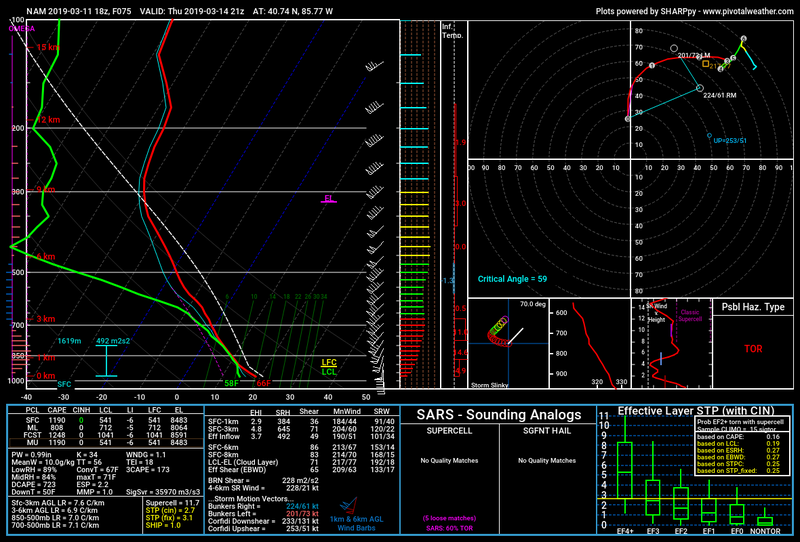 So 18z NAM is at the high end. But SREF also has the southerly surface winds that NAM has, suggesting good directional shear. The battle between the dry air and the wet air is pretty unusual for March. My dewpoints are near 50 now, extraordinary for the SW in March. Expecting to go from heavy rain, with 50-60 mph winds, and maybe some hail, to brief periods of heavy brick-like wet snow as the cold front comes in. The dew points in SE NM may top 60 or more, which is probably part of why the NAM has such a big line of thunderstorms developing in Eastern NM. Yeah I don't know what's up with this. 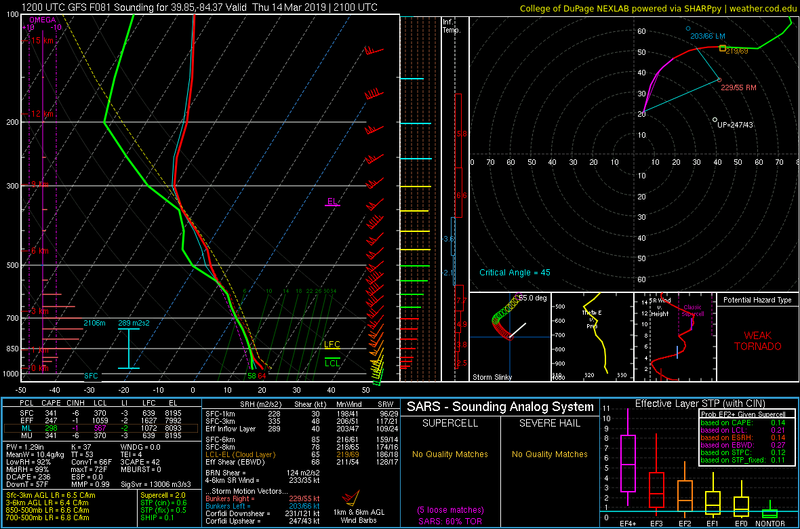 I guess it only looks at 500mb setup or something because everything about this is off. 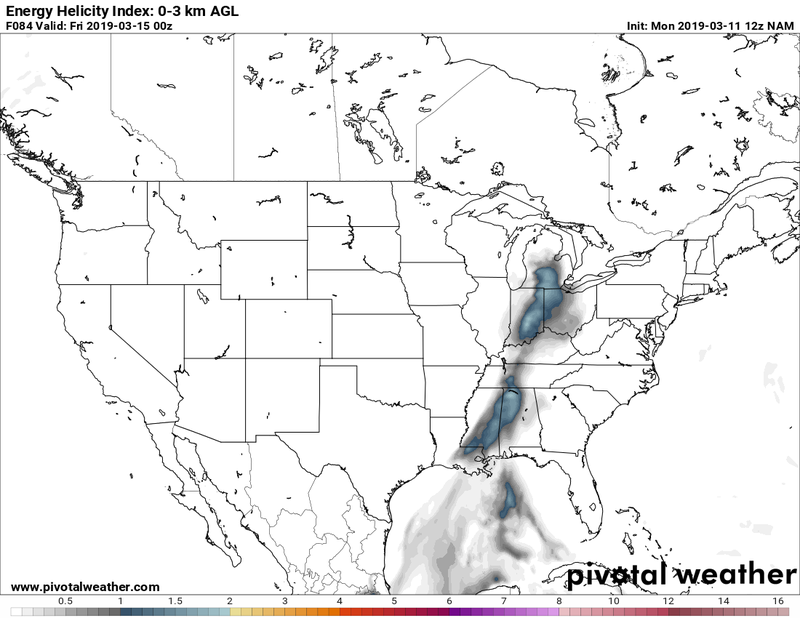 GFS took a step toward NAM... has some more southerly flow and higher instability in some places. suggests that 850 mb winds may be greater than 60 mph with jet. I would have to think if we keep seeing NAM like solutions on other models the area would get more than a marginal risk. With this and the high winds it should be an interesting day to follow. ILN not really mentioning any severe threat in their discussion other than the wind threat. A strong system will begin to approach the region Wednesday night. Temperatures will rise into the 60s to around 70 on Thursday. therefore have a chance thunder mention in the forecast as well. Thursday afternoon into Thursday night due to strong low level flow. IND has a good right up this morning and talk about a lot of different things. 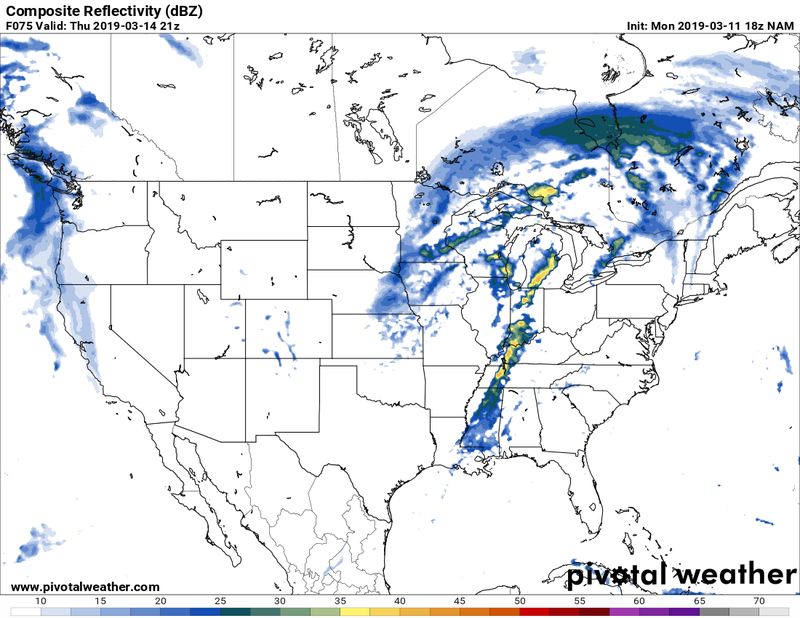 One of them being the chance for strong to severe storms. water values will climb to 1.00-1.25 inches within a narrow corridor. with embedded thunderstorms impacting the region Wednesday night. Wednesday night and early Thursday. around the base of the upper level low and pointed towards the area. 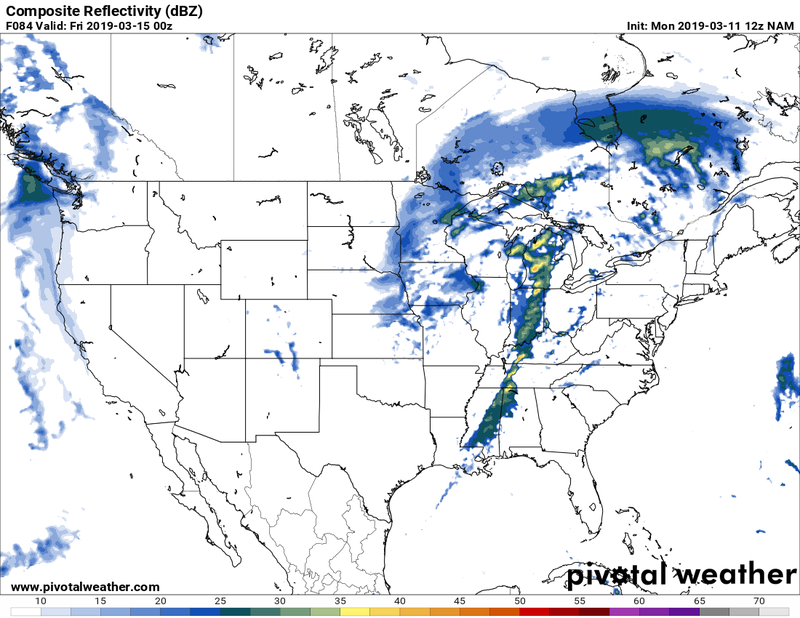 3K NAM definitely looks interesting for Indiana and western Ohio.